I replaced all of the substrate in Harriet’s enclosure with fresh Eco Earth, and I think she noticed because she’s been digging around in it all day… as you can see from all that dirt stuck to her face lol. Here she is, filled with energy and ready to run around a bit! now THAT is one happy shell baby! YOU CANNOT CONTAIN ME! I WILL BE FREEEEEEEE!!! Males have red eyes, relatively colorful leg scales, and (unlike most aquatic turtles) are larger than the females. Males also have a concave plastron (lower shell), which aids in mounting the females for mating. Females have yellowish eyes, and are less colorful on the legs and head. Is there any way you can help me identify this little dude? My family is moving into an new house, and we found it in a tank. It’s previous owners left it there ): we’ve decided to keep it but I don’t know what species it is? Please help! Hey there! WOW I honestly can’t understand how people can just abandon their animals like that. Poor shell baby is lucky you and your family moved in. That little one definitely looks like Box Turtle to me, from what I see an Eastern Box Turtle. It also looks like this shell might have an eye infection. It’s hard to tell from the pictures (and I’m not a Box turtle expert) but from what I’ve read, Boxies are prone to eye and ear infections. Looking at the pics the half-shut eyes are suspect to me. I’m guessing her or she did not have the proper temperature or humidity before you arrived. Some extra warm soaks might help here. Also make sure the temps and humidity are on point. Truly, a visit to a vet is never a bad idea, but especially with questionable health, not knowing what this poor little one has been through. Here’s one Box Turtle site with info written by someone I know works in herpetology and researchers best care. Hopefully some other folks can share their experience and direct you to more info? I see a little smile on that face of yours Littlefoot! <3 Bring on the dandelions!!! So I guess to fully answer your question (but not really), it is extremely hard to tell the age of a turtle after it has surpassed 20 years. Counting scutes could work, but like I and Carolina Box Turtles said, growth lines can vary depending on what states the turtle is in over time. Even the diagram states that counting scutes or annuli as they refer to them, can be inexact even when done by seasoned researchers. A lot of turtle parents have this question, and this is a great diagram/ answer. I got a package from Zoya and her Humom of tort-time today! Just in time for this blizzard we seem to be having… brrr. Thank you guy so much! I’m not sure if we can top this care package, but we will try!! Hugs and noms all around! Yay!!!!! It arrived! So glad it made it! Those are just your colors littlefoot. So happy you and your humom enjoyed the package. Soon tumblr will be filled with cape wearing shells ready to take on the world! You go, LIttlefoot!! Super Turtle! Growing bigger and stronger every day. Watch out world! 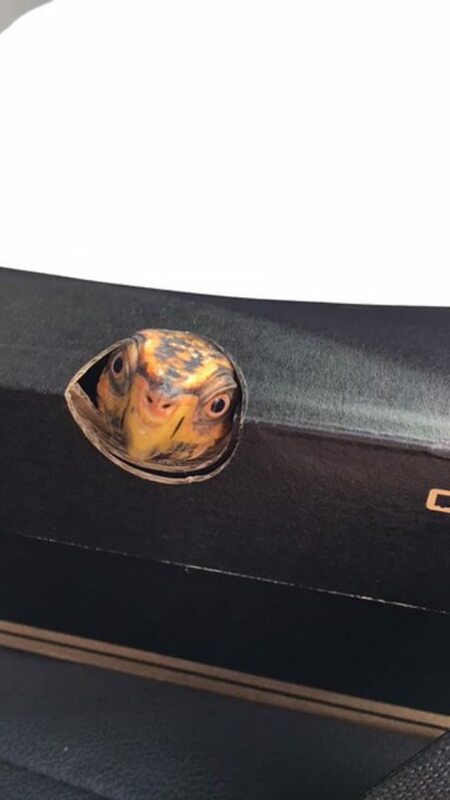 What should I use for bedding for my box turtle? From everything I’ve read and seen, Box turtles need similar substrate to Russians. A mix of coconut coir and play sand works well. Box turtles need higher levels of humidity than russian tortoises. The mix of play sand and coconut coir holds moisture pretty well without getting moldy (the problem with so many substrates). You’ll have to keep up with it but it works. Top soil is another option. Do you know what kind of box turtle you have? Heres a care sheet that has more info on eastern box turtles. And heres some great info on North American Box Turtles as a whole. This is Sheldon, one of my adopted Eastern Box Turtle rescues. He was hit by a car prior to me adopting him a year ago and luckily survived! Eastern Box Turtles are the state reptile of NC, and the most frequent animal hit by vehicles here as well. Please be careful on the roads! Sheldon thanks you! Sheldon! you’re gorgeous! Glad an awesome human adopted you! Listen to Sheldon! Remember, you’re not just sharing the road with othre humans, you’re sharing it with turtles and torts too.